I recently went to the Royal School of Needlework White Work exhibition in London, at Hampton Court Palace with a dear friend. It was an incredible day out especially as we discovered that two friends from USA were going too. Just visiting Hampton Court Palace itself is a thrilling experience as it is such a grand palace steeped in history standing in the most beautiful grounds. Although the exhibition was only an hour and a half it was so exciting to see the samples that they have in their studios. We were unable to take pictures so I cannot show you the marvellous examples of white work embroidery that were on display, but their beauty was firmly imprinted in my mind. I made sure of that! It is true to say that the antique christening gowns, bonnets, collars, table cloths and handkerchiefs were so delicate and intricate it was difficult to imagine that they were worked so long ago without magnification and artificial lighting. Some were so old, just fragments of a beautiful embroidery worked skillfully by some unknown artist. We were given a brief history of white work and told about the various forms. I had never realised that such embroidery was an indication of your status and wealth during the height of its popularity. I think it was the Ayrshire embroidery which I loved the most as it comprised of tiny leaves, sprigs and flowers. We were told that what appeared to be dolls clothes were in fact samples, like a “Curriculum Vitae” showing the quality of a needle woman’s work, including her skills at repairing. There is so much to see in the studios when you visit including current repairs and projects. I loved the huge collection of threads displayed in wonderful rainbow colours waiting to be used for the next embroidery to be worked on. Some marvellous embroideries hang their too, including a superb oriental embroidery from China and the work of some of the current students. My mind was racing throughout my visit with ideas for my next white work collection as I could see a combination of more eyelets, pulled threads, cut work and satin stitches. I was already “digitising in my head” some new stitches and techniques. There is a great shop there and you won’t be able to resist a few books and mementos of your visit to inspire you when you get home. I was amazed afterwards as I read one of the books from the shop, how the babies clothes in the nineteenth century were just similar, smaller versions of their mothers clothes. Little has changed in the world of fashion! First design from Cassandra’s White Work due to be released in 2016! As I completed the Jane’s White Work collection it became very obvious that this would soon have to be followed by a second collection which would be named after Jane Austen’s sister Cassandra. This exhibition confirmed that completely. May I encourage you to take an interest in the work of the Royal School of Needlework. Their exhibitions are so fascinating and this one is on until the end of the year. Visit the website now. Next year they are staging an exhibition on Pomegranates and Peacocks. Can I possibly stay away? 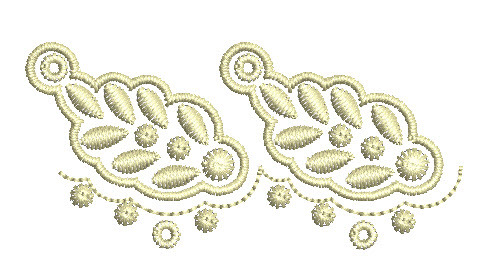 This entry was posted in Discussing machine embroidery, Inspirational and tagged white work embroidery. Bookmark the permalink. I can just imagine that you were in heaven seeing all of the beautiful and delicate white work. I can’t wait what you come up with next. …As always absolutely beautiful, so delicate and detailed. Thankfully, you have the technical expertize to bring these surviving hand-wrought 18th white work pieces into the 21st century. The website photos are truly beautiful. I am certain the Cassandra Collection will be just as lovely as the Jane’s White Work Collection. Oh, thank you so much for the description and link to the website. I did not know that there was a Royal School of Needlework–the fact that it is possible to tour is fascinating! (and dreamworthy!). I wonder where Jane Austen would have gotten her patterns? They worked on the lovely dress that the Duchess of Cambridge wore for her wedding. Although the details have to be kept secret! As well as repairs and restoration work they take commissions. There are classes and qualifications you can do with them. We didn’t let on that we were machine embroiderers!